I have submitted the following games to Gary Con X. Hope to see you there! Goblins of the Faerie Wood: 0-level funnel with goblin PCs! This is what happens when the king of your tribe sends you to the witch doctor of another tribe, because he has a toothache that won't go away. Characters and two goblin classes to level into are provided. Prince Charming, Reanimator: 0-level funnel. Your mission is to enter the ruined castle, find the place where the “Sleeping” Beauty lies, and bring her forth for Prince Charming to restore with a kiss. Characters provided. Silent Nightfall: Level 2: Recover the Whispering Stone for the King of Elfland! Silent nightfall, now to bed/A rushlight to ward your way/Hush now child, cry not child/They listen to find their prey. Through forest they come/Down dark streets they glide/O my children lie silent/We are all safe inside. Characters provided. The Falcate Idol: Level 2: The Cult of the Harrower is ancient, and each of the eight eyes of its spider-idol is rumored to be a moonstone gem the size of a pigeon's egg. Moreover, somewhere within the cult's sanctuary, a pool flows from the Egg of Creation. Characters provided. The Thing in the Chimney: 1st level. Yuletide comes but once a year. Enjoy it (very!) early with the original DCC holiday adventure! At the waning of every year, as the sun grows closer to the horizon, and spends less time in the sky, there comes a time of terrible cold and deep snow to the lands of the north. The world waits with hushed breath for this, the longest night of the year, to be over. Characters provided. Thirteen Brides of Blood: 0-level funnel. Vampires haunt the land! Erasmus Cordwainer Blood has existed for countless centuries, feeding off the blood of those villages closest to his hidden lair.This time you will seek him out, and put an end to him before he can strike! What could go wrong? Characters provided. 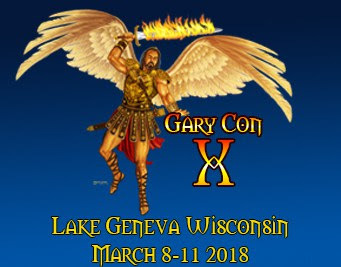 Well, registration for Gary Con X opened while I was away in Scotland. I am now registered, but I have no idea what games to run for the convention, being rather busy catching up on overdue writing. So, I put it out to you.....Is there anything in particular you'd like me to schedule? I've explored caves, castles, ruins, tombs, and cities. Scotland is a beautiful country, and if you are ever given a chance to go, you should take it.